Google Maps is a web mapping service developed by Google. It offers satellite imagery, aerial photography, street maps, 360° panoramic views of streets (Street View), real-time traffic conditions, and route planning for traveling by foot, car, bicycle and air (in beta), or public transportation. Google Maps' satellite view is a "top-down" or "birds eye" view; most of the high-resolution imagery of cities is aerial photography taken from aircraft flying at 800 to 1,500 feet (240 to 460 m), while most other imagery is from satellites. Much of the available satellite imagery is no more than three years old and is updated on a regular basis. Google Maps used a variant of the Mercator projection, and therefore cannot accurately show areas around the poles. However, in August 2018, the desktop version of Google Maps was updated to show a 3D globe. Google Maps for Android and iOS devices was released in September 2008 and features GPS turn-by-turn navigation along with dedicated parking assistance features. In August 2013, it was determined to be the world's most popular app for smartphones, with over 54% of global smartphone owners using it at least once. ✪ 10 Creepy Google Maps Images, Finally Explained! Google Maps first started as a C++ program designed by two Danish brothers, Lars and Jens Eilstrup Rasmussen, at the Sydney-based company Where 2 Technologies. It was first designed to be separately downloaded by users, but the company later pitched the idea for a purely Web-based product to Google management, changing the method of distribution. In October 2004, the company was acquired by Google Inc. where it transformed into the web application Google Maps. In the same month, Google acquired Keyhole, a geospatial data visualization company (with controversial investment from the CIA), whose marquee application suite, Earth Viewer, emerged as the highly successful Google Earth application in 2005 while other aspects of its core technology were integrated into Google Maps. In September 2004, Google acquired ZipDash, a company that provided realtime traffic analysis. In September 2005, in the aftermath of Hurricane Katrina, Google Maps quickly updated its satellite imagery of New Orleans to allow users to view the extent of the flooding in various parts of that city. On November 28, 2007, Google Maps for Mobile 2.0 was released. It featured a beta version of a "My Location" feature, which uses the GPS / Assisted GPS location of the mobile device, if available, supplemented by determining the nearest wireless networks and cell sites. The software looks up the location of the cell site using a database of known wireless networks and sites. By triangulating the different signal strengths from cell transmitters and then using their location property (retrieved from the database), My Location determines the user's current location. On September 23, 2008, coinciding with the announcement of the first commercial Android device, Google announced that a Google Maps app had been released for its Android operating system. In October 2009, Google replaced Tele Atlas as their primary supplier of geospatial data in the US version of Maps and used their own data. In December 2012, the Google Maps application was separately made available in the App Store, after Apple removed it from its default installation of the mobile operating system version iOS 6 in September 2012. On January 29, 2013, Google Maps was updated to include a map of North Korea. As of May 3, 2013[update], Google Maps recognizes Palestine as a country, instead of redirecting to the Palestinian territories. In August 2013, Google Maps removed the Wikipedia Layer, which provided links to Wikipedia content about locations shown in Google Maps using Wikipedia geocodes. On April 12, 2014, Google Maps was updated to reflect the 2014 Crimean crisis. Crimea is shown as the Republic of Crimea in Russia and as the Autonomous Republic of Crimea in Ukraine. All other versions show a dotted disputed border. On July 14, 2015, the Chinese name for Scarborough Shoal was removed after a petition from the Philippines was posted on Change.org. On June 27, 2016, Google rolled out new satellite imagery worldwide sourced from Landsat 8, comprising over 700 trillion pixels of new data. In September 2016, Google Maps acquired mapping analytics startup Urban Engines. In August 2018, Google Maps designed its overall view (when zoomed out completely) into a 3D globe dropping the Mercator projection, which was used to project the planet onto a flat surface. In January 2019, Google Maps added speed trap and speed camera alerts as reported by other users. Google Maps provides a route planner, allowing users to find available directions through driving, public transportation, walking, or biking. Google has partnered globally with over 800 public transportation providers to adopt General Transit Feed Specification (GTFS), making the data available to third parties. On May 25, 2007, Google released Google Street View, a new feature of Google Maps which provides 360° panoramic street-level views of various locations. On the date of release, the feature only included five cities in the US. It has since expanded to thousands of locations around the world. In July 2009, Google began mapping college campuses and surrounding paths and trails. Street View garnered much controversy after its release because of privacy concerns about the uncensored nature of the panoramic photographs, although the views are only taken on public streets. Since then, Google has begun blurring faces and license plates through automated facial recognition. In late 2014, Google launched Google Underwater Street View, including 2,300 kilometres (1,400 mi) of the Australian Great Barrier Reef in 3D. The images are taken by special cameras which turn 360 degrees and take shots every 3 seconds. In December 2009, Google introduced a new view consisting of 45° angle aerial imagery, offering a "bird's eye view" of cities. The first cities available were San Jose and San Diego. This feature was initially available only to developers via the Google Maps API. In February 2010, it was introduced as an experimental feature in Google Maps Labs. In July 2010, 45° imagery was made available in Google Maps in select cities in the United States and worldwide. Google collates business listings from multiple on-line and off-line sources. To reduce duplication in the index, Google's algorithm combines listings automatically based on address, phone number, or geocode, but sometimes information for separate businesses will be inadvertently merged with each other, resulting in listings inaccurately incorporating elements from multiple businesses. Google allows business owners to verify their own business data through Google My Business, and has also recruited volunteers to check and correct ground truth data. Google Local Guides is a program launched by Google Maps to enable its users to contribute to Google Maps and provide them additional perks and benefits for the work. The program is partially a successor to Google Map Maker as features from the former program became integrated into the website and app. The program consists of adding reviews, photos, basic information, videos and correcting information such as wheelchair accessibility. The version of Google Street View for classic Google Maps required Adobe Flash. 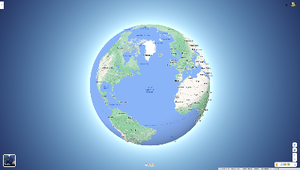 In October 2011, Google announced MapsGL, a WebGL version of Maps with better renderings and smoother transitions. Indoor maps uses JPG, .PNG, .PDF, .BMP, or .GIF, for floor plans. Users who are logged into a Google Account can save locations so that they are overlaid on the map with various colored "pins" whenever they browse the application. These "Saved places" can be organised into user named lists and shared with other users. One default list "Starred places" also automatically creates a record in another Google product, Google Bookmarks. The Google Maps terms and conditions state that usage of material from Google Maps is regulated by Google Terms of Service and some additional restrictions. Google has either purchased local map data from established companies, or has entered into lease agreements to use copyrighted map data. The owner of the copyright is listed at the bottom of zoomed maps. For example, street maps in Japan are leased from Zenrin. Street maps in China are leased from AutoNavi. Russian street maps are leased from Geocentre Consulting and Tele Atlas. Data for North Korea is sourced from the companion project Google Map Maker. Street map overlays, in some areas, may not match up precisely with the corresponding satellite images. The street data may be entirely erroneous, or simply out of date: "The biggest challenge is the currency of data, the authenticity of data," said Google Earth representative Brian McClendon. As a result, in March 2008 Google added a feature to edit the locations of houses and businesses. Due to restrictions on geographic data in China, Google Maps must partner with a Chinese digital map provider in order to legally show China map data. Since 2006, this partner has been AutoNavi. Within China, the State Council mandates that all maps of China use the GCJ-02 coordinate system, which is offset from the WGS-84 system used in most of the world. google.cn/maps (formerly Google Ditu) uses the GCJ-02 system for both its street maps and satellite imagery. google.com/maps also uses GCJ-02 data for the street map, but uses WGS-84 coordinates for satellite imagery, causing the so-called China GPS shift problem. Frontier alignments also present some differences between google.cn/maps and google.com/maps. On the latter, sections of the Chinese border with India and Pakistan are shown with dotted lines, indicating areas or frontiers in dispute. However, google.cn shows the Chinese frontier strictly according to Chinese claims with no dotted lines indicating the border with India and Pakistan. For example, the South Tibet region claimed by China but administered by India as a large part of Arunachal Pradesh is shown inside the Chinese frontier by google.cn, with Indian highways ending abruptly at the Chinese claim line. Google.cn also shows Taiwan and the South China Sea Islands as part of China. Google Ditu's street map coverage of Taiwan no longer omits major state organs, such as the Presidential Palace, the five Yuans, and the Supreme Court. In areas where Google Map Maker was available, for example, much of Asia, Africa, Latin America and Europe as well as the United States and Canada, anyone who logged into their Google account could directly improve the map by fixing incorrect driving directions, adding biking trails, or adding a missing building or road. General map errors in Australia, Austria, Belgium, Denmark, France, Liechtenstein, Netherlands, New Zealand, Norway, South Africa, Switzerland, and the United States could be reported using the Report a Problem link in Google Maps and would be updated by Google. For areas where Google used Tele Atlas data, map errors could be reported using Tele Atlas map insight. Google Maps is available as a mobile app for the Android and iOS mobile operating systems. The Android app was first released in September 2008, though the GPS-localization feature had been in testing on cellphones since 2007. Up until iOS 6, the built-in maps application on the iOS operating system was powered by Google Maps. However, with the announcement of iOS 6 in June 2012, Apple announced that they had created their own Apple Maps mapping service, which officially replaced Google Maps when iOS 6 was released on September 19, 2012. However, at launch, Apple Maps received significant criticism from users due to inaccuracies, errors and bugs. One day later, The Guardian reported that Google was preparing its own Google Maps app, which was released on December 12, 2012. Within only two days, the application had been downloaded over ten million times. The Google Maps apps for iOS and Android have many of the same features, including turn-by-turn navigation, street view, and public transit information. Turn-by-turn navigation was originally announced by Google as a separate beta testing app exclusive to Android 2.0 devices in October 2009. The original standalone iOS version did not support the iPad, but tablet support was added with version 2.0 in July 2013. An update in June 2012 for Android devices added support for offline access to downloaded maps of certain regions, a feature that was eventually released for iOS devices, and made more robust on Android, in May 2014. USA Today welcomed the application back to iOS, saying: "The reemergence in the middle of the night of a Google Maps app for the iPhone is like the return of an old friend. Only your friend, who'd gone missing for three months, comes back looking better than ever." Jason Parker of CNET, calling it "the king of maps", said, "With its iOS Maps app, Google sets the standard for what mobile navigation should be and more." Bree Fowler of the Associated Press compared Google's and Apple's map applications, saying: "The one clear advantage that Apple has is style. Like Apple devices, the maps are clean and clear and have a fun, pretty element to them, especially in 3-D. But when it comes down to depth and information, Google still reigns superior and will no doubt be welcomed back by its fans." Gizmodo gave it a ranking of 4.5 stars, stating: "Maps Done Right". According to The New York Times, Google "admits that it’s [iOS app is] even better than Google Maps for Android phones, which has accommodated its evolving feature set mainly by piling on menus". In 2005 the Australian Nuclear Science and Technology Organization (ANSTO) complained about the potential for terrorists to use the satellite images in planning attacks, with specific reference to the Lucas Heights nuclear reactor; however, the Australian Federal government did not support the organization's concern. At the time of the ANSTO complaint, Google had colored over some areas for security (mostly in the US), such as the rooftop of the White House and several other Washington, D.C., US buildings. In October 2010, Nicaraguan military commander Edén Pastora stationed Nicaraguan troops on the Isla Calero (in the delta of the San Juan River), justifying his action on the border delineation given by Google Maps. Google has since updated its data which it found to be incorrect. On January 27, 2014, documents leaked by Edward Snowden revealed that the NSA and the GCHQ intercepted Google Maps queries made on smartphones, and used them to locate the users making these queries. One leaked document, dating to 2008, stated that "[i]t effectively means that anyone using Google Maps on a smartphone is working in support of a GCHQ system." Naver Maps – a South Korean mapping service offering a comprehensive map of South Korea and Jeju. ^ "Google Company: Our history in depth". google.co.uk. Google. Archived from the original on April 6, 2016. Retrieved June 13, 2016. ^ "What is the Google Maps API?". Archived from the original on April 20, 2012. ^ Perez, Sarah. "Google to shut down Map Maker, its crowdsourced map editing tool | TechCrunch". Archived from the original on August 11, 2017. Retrieved June 23, 2017. ^ "Blurry or Outdated Imagery". Archived from the original on October 24, 2013. ^ "How Often is Google Maps and Google Earth Updated?". Technicamix.com. October 18, 2011. Archived from the original on December 3, 2013. Retrieved November 24, 2013. ^ "Google+ Smartphone App Popularity". Business Insider. Archived from the original on September 6, 2013. Retrieved September 6, 2013. ^ Carlson, Nicholas. "To Do What Google Does In Maps, Apple Would Have To Hire 7,000 People". Business Insider Australia. Archived from the original on August 20, 2016. Retrieved March 6, 2016. ^ "Google mapper: Take browsers to the limit – CNET News". News.cnet.com. Archived from the original on October 26, 2012. Retrieved January 3, 2013. ^ Kiss, Jemima (June 17, 2009). "Secrets of a nimble giant – guardian.co.uk". London: Guardian. Archived from the original on February 19, 2014. Retrieved October 30, 2010. ^ Orlowski, Andrew (October 28, 2004). "Google buys CIA-backed mapping startup". The Register. Archived from the original on February 11, 2017. Retrieved April 27, 2017. ^ Michael Bazeley (March 30, 2005). "Google acquires traffic info start-up Zipdash". SiliconBeat. Archived from the original on January 2, 2008. Retrieved January 8, 2008. ^ "Google Maps announcement on Google Blog". Googleblog.blogspot.com. Archived from the original on August 5, 2012. Retrieved January 12, 2010. ^ "Google accused of airbrushing Katrina history". msnbc. March 30, 2007. Archived from the original on September 29, 2009. ^ "Google Restores Katrina's Scars To Google Earth". Information Week. April 2, 2007. Archived from the original on August 19, 2009. ^ "Google Announces Launch of Google Maps for Mobile With "My Location" Technology". News from Google. Google. November 28, 2007. Retrieved April 25, 2017. ^ a b Marshall, Matt (November 28, 2007). "Google releases useful "my location" feature for cellphones". VentureBeat. Retrieved April 25, 2017. ^ a b Schonfeld, Erick (November 28, 2007). "Google Mobile Maps PinPoints Your Location Without GPS". TechCrunch. AOL. Retrieved April 25, 2017. ^ Ray, Bill (November 29, 2007). "Google Maps Mobile knows where you are". The Register. Situation Publishing. Retrieved April 25, 2017. ^ Mills, Elinor (November 28, 2007). "Google Maps for Mobile adds 'My Location' feature". CNET. CBS Interactive. Retrieved April 25, 2017. ^ Overbo, Mike (November 28, 2007). "Google Maps: My Location". iMore. Retrieved April 25, 2017. ^ Vanlerberghe, Mac (September 23, 2008). "Google on Android". Google Mobile Blog. Google. Retrieved April 30, 2017. ^ Tseng, Erick (September 23, 2008). "The first Android-powered phone". Official Google Blog. Google. Retrieved April 30, 2017. ^ "Google Replaces Tele Atlas Data in US with Google StreetView Data". blumenthals.com. October 12, 2009. Archived from the original on October 15, 2009. ^ "France Convicts Google for Its Free(dom)". NBC San Diego. February 3, 2012. Archived from the original on October 18, 2014. Retrieved October 13, 2014. ^ "Google begins mapping UK rivers". Telegraph. June 19, 2012. Archived from the original on June 19, 2012. Retrieved June 20, 2012. ^ "Google Maps for iOS Hits Apple App Store". PCMag. Archived from the original on December 16, 2012. Retrieved December 12, 2012. ^ Cavan Sieczkowski (January 29, 2013). "Google Maps North Korea: Prison Camps, Nuclear Complexes Pinpointed In New Images (PHOTOS)". The Huffington Post. Archived from the original on February 9, 2013. Retrieved May 20, 2013. ^ "Google changes Palestinian location from 'Territories' to 'Palestine'". Fox News. Associated Press. May 3, 2013. Archived from the original on May 21, 2013. Retrieved May 20, 2013. ^ "Google Maps Displays Crimean Border Differently In Russia, U.S." NPR.org. April 12, 2014. Archived from the original on November 26, 2014. Retrieved December 4, 2014. ^ Hern, Alex (April 24, 2015). "Google Maps hides an image of the Android robot urinating on Apple". The Guardian. Archived from the original on May 17, 2015. Retrieved May 22, 2015. ^ Kanakarajan, Pavithra (May 22, 2015). "Map Maker will be temporarily unavailable for editing starting May 12, 2015". Google Product Forums. Retrieved May 10, 2015. ^ "Google Is Getting Rid of Classic Maps for Good (Ugh.)". April 29, 2015. Archived from the original on May 15, 2015. Retrieved May 14, 2015. ^ "Google Maps alters disputed South China Sea shoal name". BBC. Archived from the original on July 14, 2015. Retrieved July 14, 2015. ^ Meyer, Robinson (June 27, 2016). "Google's Satellite Map Gets a 700-Trillion-Pixel Makeover". The Atlantic. Archived from the original on June 27, 2016. Retrieved June 27, 2016. ^ Heater, Brian. "Google Maps picks up mapping analytics and visualization startup Urban Engines". TechCrunch. Archived from the original on September 17, 2016. Retrieved September 16, 2016. ^ Keshia Badalge; Cullen Fairchild (26 February 2018). "One thing North Korea has that the South doesn't: Google Maps". Asia Times. ^ Marquardt, Stafford (October 16, 2017). "Space out with planets in Google Maps". Blog.Google. Google. Archived from the original on October 16, 2017. Retrieved October 17, 2017. ^ Lardinois, Frederic (October 16, 2017). "Google Maps now lets you explore your local planets and moons". TechCrunch. Archived from the original on October 16, 2017. Retrieved October 17, 2017. ^ Protalinski, Emil (May 2, 2018). "Google Maps Platform arrives with pay-as-you-go billing, free support, and Cloud requirement starting June 11". VentureBeat. Archived from the original on December 4, 2018. Retrieved April 3, 2019. ^ "Google Maps now depicts the Earth as a globe". The Verge. Retrieved 2018-08-06. ^ "Speed trap warnings begin rolling out to some Google Maps users". Android Central. 2019-01-16. Retrieved 2019-01-16. ^ Luckerson, Victor (February 9, 2015). "10 Google Maps Tricks You Need to Know". Time. Archived from the original on February 9, 2015. Retrieved December 7, 2017. ^ "Get directions and show routes". Google Maps Help. Google. Archived from the original on July 2, 2016. Retrieved December 7, 2017. ^ Brown, Jessica (2017-09-26). "Google Maps must improve if it wants cyclists to use it". the Guardian. Retrieved 2018-07-12. ^ "The Case for Unshackling Transit Data". CityLab. Retrieved 2018-07-12. ^ Wang, David (February 28, 2007). "Stuck in traffic?". Google. ^ "Real time traffic information with Google Maps". CrackBerry. March 22, 2007. Retrieved June 23, 2014. ^ Matthews, Susan E. (July 3, 2013). "How Google Tracks Traffic". The Connectivist. Archived from the original on February 22, 2014. ^ Barth, Dave (August 25, 2009). "The Bright Side of Sitting in Traffic: Crowdsourcing Road Congestion Data". Google. ^ Matthews, Susan E. (July 3, 2013). "How Google Tracks Traffic". The Connectivist. ^ "Help Google Maps find my location". Support.google.com. 1970-01-01. Retrieved 2016-12-08. ^ "The Google 'ick' factor". July 15, 2007. Archived from the original on August 17, 2009. ^ Poulsen, Kevin (July 15, 2007). "Want Off Street View?". Wired. Archived from the original on June 18, 2007. ^ Petronzio i, Matt (August 22, 2012). "11 Fascinating Facts About Google Maps". Mashable. Archived from the original on April 10, 2015. Retrieved April 3, 2015. Google employs automatic face and license plate blurring technology to protect people’s privacy in Street View, and users can even request additional blurring. Aerial imagery provides much less detail and resolution. ^ "Google begins blurring faces in Street View". CBS Interactive Inc. May 13, 2008. Archived from the original on June 26, 2011. ^ "How Google Street View Became An Art Form". Fast Company. 2017-05-25. Retrieved 2018-07-12. ^ "Google Launches Underwater Street View". November 16, 2014. Archived from the original on November 29, 2014. ^ Wilson, Randy (2009-12-08). "Google LatLong: Changing your perspective". Google-latlong.blogspot.com. Retrieved 2010-09-18. ^ Schroeder, Stan (February 12, 2010). "Google Maps Get Labs With 9 Cool New Features". Mashable. Archived from the original on February 16, 2017. Retrieved April 3, 2019. ^ Axon, Samuel (July 11, 2010). "Google Maps Adds 45° Aerial Imagery For All Users". Mashable. Archived from the original on December 17, 2017. Retrieved April 3, 2019. ^ "The Google Local map results have "merged" our listing with another in the same building – Maps Help". Google.com. April 22, 2009. Retrieved January 13, 2010. ^ "Google Maps Merging Mania Due to Algo-Change". April 29, 2009. Archived from the original on May 3, 2009. ^ "Phone and Text Verification on Google Maps". Chaddo.com. June 7, 2017. Archived from the original on January 3, 2018. Retrieved January 2, 2018. ^ Helft, Miguel (November 17, 2009). "Online Maps: Everyman Offers New Directions". New York Times. Archived from the original on March 12, 2017. Retrieved April 27, 2017. ^ "Sneaky ways to top Google's local listings". Econsultancy. April 30, 2010. Archived from the original on January 16, 2013. Retrieved January 3, 2013. ^ Revell, Timothy (April 7, 2017). "Thousands of fake companies added to Google Maps every month". New Scientist. Archived from the original on April 16, 2017. Retrieved April 15, 2017. ^ "Inside Google's Fascinating Stash of 10,000 Indoor Maps". WIRED. Retrieved 2018-07-12. ^ Marshall, Matt (April 5, 2007). "Google releases My Maps". VentureBeat. Archived from the original on April 4, 2019. Retrieved April 4, 2019. ^ Lardinois, Frederic (March 27, 2013). "Google Launches Maps Engine Lite, Makes It Easy To Create Advanced Custom Maps". TechCrunch. Archived from the original on April 4, 2019. Retrieved April 4, 2019. ^ Pratap, Ketan (September 17, 2014). "Google Rebrands Maps Engine to 'My Maps', Adds Improved Search and More". NDTV Gadgets 360. Archived from the original on April 4, 2019. Retrieved April 4, 2019. ^ "Google Map Maker has closed". Google Map Maker help. Retrieved August 3, 2018. ^ "Google Testing Video Reviews in Maps". NDTV Gadgets360.com. Retrieved June 20, 2018. ^ "Google calls on Local Guides to add wheelchair info to Maps". SlashGear. 2017-09-07. Retrieved 2018-07-12. ^ Gautham A. S. "Google Revises Their Map, Adds Offline Version and 3D Imaging". TechGau.org. Archived from the original on June 13, 2012. Retrieved June 9, 2012. ^ Arthur, Charles (March 20, 2009). "Where the streets all have Google's name". The Guardian. Archived from the original on March 5, 2017. Retrieved April 27, 2017. ^ "Step inside the map with Google MapsGL". Googleblog.blogspot.com. Archived from the original on April 10, 2012. Retrieved April 25, 2012. ^ "Use indoor maps to view floor plans – Computer – Google Maps Help". Archived from the original on February 27, 2017. ^ "Google Maps Terms". Maps.google.com. Archived from the original on February 8, 2010. Retrieved January 13, 2010. ^ "Google Terms of Service". Google.com. April 16, 2007. Archived from the original on January 25, 2012. Retrieved January 13, 2010. ^ a b Lee, Mark (July 5, 2012). "Apple Shares Google China Map Partner in Win for Autonavi". Archived from the original on October 18, 2014. ^ "Improve information in Google Maps for the world to see". Google. Archived from the original on December 12, 2007. ^ Balakrishnan, Ramesh (March 18, 2008). "Google LatLong: It's your world. Map it". Google-latlong.blogspot.com. Archived from the original on December 30, 2009. Retrieved January 13, 2010. ^ Johnson, Jenna (July 22, 2007). "Google's View of D.C. Melds New and Sharp, Old and Fuzzy". Washington Post. Archived from the original on February 13, 2011. Retrieved May 3, 2010. ^ "User Guide | Google Maps Platform | Google Maps Platform". Google Cloud. Retrieved 2018-07-10. ^ "Google Maps API – Terms of use". Archived from the original on December 24, 2013. ^ Ian Rose. "PHP and MySQL: Working with Google Maps". Syntaxxx. Archived from the original on October 18, 2014. Retrieved October 13, 2014. ^ "A fresh new look for the Maps API, for all one million sites". googlegeodevelopers.google.com. May 15, 2013. Archived from the original on November 28, 2013. ^ "ProgrammableWeb API dashboard". www.programmableweb.com. Archived from the original on April 30, 2016. Retrieved May 4, 2016. ^ Alan Eustace (September 2, 2011). "A fall spring-clean". Google. Archived from the original on September 7, 2011. Retrieved September 2, 2011. ^ "Google Maps API FAQ". Archived from the original on January 16, 2014. ^ "Google Maps API FAQ Usage Limits". Archived from the original on January 16, 2014. ^ "Google Maps API for Business". Archived from the original on December 24, 2013. ^ "Google increases prices of Google Maps API and developers are not happy". PPC Land. 2018-05-11. Retrieved 2018-12-26. ^ Monument to the People's Heroes. "Google China street map uses GCJ-02 coordinates". Archived from the original on May 25, 2017. Retrieved April 8, 2015. ^ Monument to the People's Heroes. "Google China satellite imagery uses GCJ-02 coordinates". Archived from the original on May 25, 2017. Retrieved April 8, 2015. ^ Monument to the People's Heroes. "Google.com satellite imagery uses WGS-84 coordinates". Archived from the original on November 18, 2015. Retrieved April 8, 2015. ^ "Where We've Been & Where We're Headed Next". Google. Archived from the original on September 28, 2017. Retrieved January 2, 2018. ^ "See where your friends are with Google Latitude". February 4, 2009. Archived from the original on December 30, 2009. ^ "Privacy fears over Google tracker". BBC News. February 5, 2009. Archived from the original on February 17, 2009. Retrieved February 16, 2009. ^ "Google Maps will let you share your location with friends and family for a specific period of time". techcrunch.com. Archived from the original on March 22, 2017. Retrieved March 22, 2017. ^ "Fix an error on Google Maps". Google. Archived from the original on September 1, 2013. Retrieved August 11, 2011. ^ "Tele Atlas Map Insight map feedback". Tele Atlas. Retrieved August 11, 2011. ^ "Google contact request form". Archived from the original on July 4, 2014. Retrieved October 4, 2014. ^ Google Map Maker Team (November 8, 2016). "Google Map Maker graduates to Google Maps". Google Map Maker forum. Google.com. Retrieved April 16, 2017. ^ "Google Maps - Navigation & Transit APKs". APKMirror. Retrieved May 26, 2018. ^ "Maps - Navigation & Transit (Android Wear) APKs". APKMirror. Android Police. Retrieved May 1, 2018. ^ "Google Maps - Navigation & Transit on the App Store". iTunes Store (US). Retrieved May 26, 2018. ^ Vanlerberghe, Mac (September 23, 2008). "Google on Android". Google Mobile Blog. Google. Archived from the original on December 7, 2017. Retrieved April 30, 2017. ^ Tseng, Erick (September 23, 2008). "The first Android-powered phone". Official Google Blog. Google. Archived from the original on December 7, 2017. Retrieved April 30, 2017. ^ "Google Announces Launch of Google Maps for Mobile With "My Location" Technology". News from Google. Google. November 28, 2007. Archived from the original on April 26, 2017. Retrieved April 25, 2017. ^ Marshall, Matt (November 28, 2007). "Google releases useful "my location" feature for cellphones". VentureBeat. Archived from the original on April 25, 2017. Retrieved April 25, 2017. ^ Schonfeld, Erick (November 28, 2007). "Google Mobile Maps PinPoints Your Location Without GPS". TechCrunch. AOL. Archived from the original on April 26, 2017. Retrieved April 25, 2017. ^ Gates, Sara (June 11, 2012). "Apple Maps App Officially Debuts, Google Maps Dropped (PHOTOS)". HuffPost. AOL. Retrieved April 30, 2017. ^ Chen, Brian X.; Wingfield, Nick (September 19, 2012). "Apple's iPhone Update Leaves Out Google's Maps". The New York Times. Retrieved April 30, 2017. ^ "New Apple maps app under fire from users". BBC. September 20, 2012. Retrieved April 30, 2017. ^ Patel, Nilay (September 20, 2012). "Wrong turn: Apple's buggy iOS 6 maps lead to widespread complaints". The Verge. Vox Media. Retrieved April 30, 2017. ^ Arthur, Charles (September 20, 2012). "Apple's self-inflicted maps issue is a headache – but don't expect an apology". The Guardian. Guardian Media Group. Retrieved April 30, 2017. ^ Olanoff, Drew (December 12, 2012). "Google Launches Native Maps For iOS, And Here's The Deep Dive On Navigation, Info Sheets And More". TechCrunch. AOL. Retrieved April 30, 2017. ^ Bohn, Dieter (December 12, 2012). "Google Maps for iPhone is here: how data and design beat Apple". The Verge. Vox Media. Retrieved April 30, 2017. ^ Keizer, Gregg (December 18, 2012). "Google Maps snares 10M downloads on iOS App Store". Computerworld. International Data Group. Retrieved April 30, 2017. ^ Musil, Steven (December 12, 2012). "Google Maps returns to iOS as an app after Apple's removal". CNET. CBS Interactive. Retrieved April 30, 2017. ^ a b Rodriguez, Salvador (December 13, 2012). "Google Maps returns to iPhone; iPad app coming soon". Los Angeles Times. Tronc. Retrieved April 30, 2017. ^ Arrington, Michael (October 28, 2009). "Google Redefines GPS Navigation Landscape: Google Maps Navigation For Android 2.0". TechCrunch. AOL. Retrieved April 30, 2017. ^ Schroeder, Stan (October 28, 2009). "Google Maps Navigation Becomes Reality on Android". Mashable. Retrieved April 30, 2017. ^ Fingas, Jon (July 16, 2013). "Google Maps 2.0 for iOS starts rolling out with iPad support, indoor maps (update: offline maps too)". Engadget. AOL. Retrieved April 30, 2017. ^ Ingraham, Nathan (June 27, 2012). "Google Maps for Android now supports saving maps for offline use". The Verge. Vox Media. Retrieved April 30, 2017. ^ Lawler, Richard (June 27, 2012). "Google Maps offline for Android is available today in version 6.9, also Compass Mode for Street View". Engadget. AOL. Retrieved April 30, 2017. ^ Kastrenakes, Jacob (May 6, 2014). "Google Maps for iOS and Android add offline support, lane guidance, and Uber integration". The Verge. Vox Media. Retrieved April 30, 2017. ^ Siegal, Jacob (May 6, 2014). "Google Maps just got a huge update – here are the 5 best new features". BGR. Penske Media Corporation. Retrieved April 30, 2017. ^ "Google Maps Now Available Offline". www.govtech.com. Retrieved November 19, 2016. ^ "Download areas and navigate offline - iPhone & iPad - Google Maps Help". support.google.com. Retrieved November 19, 2016. ^ "How to use Google Maps when you don't have a connection". The Independent. Retrieved June 29, 2018. ^ "How to use Google Maps offline - AndroidPIT". AndroidPIT. Retrieved November 19, 2016. ^ Welch, Chris (January 26, 2017). "Google Maps now tells you how hard it is to park in some cities". The Verge. Vox Media. Retrieved December 7, 2017. ^ Haselton, Todd (April 26, 2017). "How to use a new Google Maps feature to help you find your parked car". CNBC. NBCUniversal News Group. Retrieved December 7, 2017. ^ Sawers, Paul (April 26, 2017). "Google Maps now makes it easier to remember where you parked your car". VentureBeat. Retrieved December 7, 2017. ^ Gartenberg, Chaim (August 29, 2017). "Google Maps will now help you find parking". The Verge. Vox Media. Retrieved December 7, 2017. ^ Ghoshal, Abhimanyu (December 5, 2017). "Google Maps' new two-wheeler mode shows faster routes for beating traffic on your bike". The Next Web. Retrieved December 7, 2017. ^ Jonnalagadda, Harish (December 5, 2017). "Google Maps gets a dedicated two-wheeler mode in India". Android Central. Mobile Nations. Retrieved December 7, 2017. ^ "Baig: Google Maps app - welcome return of an old friend". USA Today. Gannett Company. December 13, 2012. Retrieved April 30, 2017. ^ Parker, Jason (November 6, 2014). "Google Maps for iOS review". CNET. CBS Interactive. Retrieved April 30, 2017. ^ Fowler, Bree (December 16, 2012). "App review: Google Maps on iOS is back with a bang". FirstPost. Retrieved April 30, 2017. ^ Diaz, Jesus (December 13, 2012). "Google Maps for iOS Review: Maps Done Right". Gizmodo. Univision Communications. Retrieved April 30, 2017. ^ Pogue, David (December 12, 2012). "Maps App for iPhone Steers Right". The New York Times. Retrieved April 30, 2017. ^ Tweney, Dylan (August 17, 2014). "Yes, Google Maps is tracking you. Here's how to stop it". VentureBeat. Retrieved April 30, 2017. ^ Elliott, Matt (April 20, 2017). "Is Google is tracking you? Find out here". CNET. CBS Interactive. Retrieved April 30, 2017. ^ Kumparak, Greg (December 18, 2013). "Google's Location History Browser Is A Minute-By-Minute Map Of Your Life". TechCrunch. AOL. Retrieved April 30, 2017. ^ Mirani, Leo (April 3, 2014). "Google's sneaky new privacy change affects 85% of iPhone users—but most of them won't have noticed". Quartz. Atlantic Media. Retrieved April 30, 2017. ^ "Blurred Out: 51 Things You Aren't Allowed to See on Google Maps". Archived from the original on July 21, 2009. ^ Google Maps: The White House. "Google Maps: The White House — Elliott C. Back". Elliottback.com. Archived from the original on December 1, 2008. Retrieved August 27, 2010. ^ Karen Barlow (August 8, 2005). "Google Earth prompts security fears". ABC News Online. Archived from the original on June 16, 2009. Retrieved November 4, 2013. ^ "CNN: "Google Maps border becomes part of international dispute"". Articles.cnn.com. November 5, 2010. Archived from the original on May 8, 2012. Retrieved April 25, 2012. ^ Ball, James (January 28, 2014). "Angry Birds and 'leaky' phone apps targeted by NSA and GCHQ for user data". The Guardian. Archived from the original on March 2, 2014. Retrieved March 3, 2014. ^ "Untitled Document". archive.org. October 3, 2002. ^ Richardson, Nikita (June 5, 2015). "YAHOO WILL SHUT DOWN ITS MAPS, OTHER SITES THIS MONTH". Fast Company. Archived from the original on June 26, 2015. Retrieved June 25, 2015. Etymology of the word "Earth"